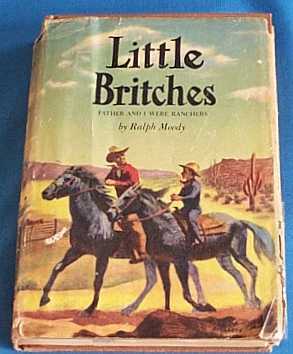 That all thoroughly explained, I dove into Little Britches . The book is set in 1906-11 and tells the story of Ralph Moody as a boy. Back around the turn of the century, his parents decided to travel from the East Coast to the west where they were promised a land flowing with milk and honey. Upon arrival they realized that they had been misled and as they gazed upon their dilapidated new ranch home, his parents resolved to make a go of it and give it everything that they had to give. Thus the Moody family was established near Littleton, Colorado. Life out west was hard on the family. Ralph's father, Charlie, had some serious health issues which is why the family had opted to move in the first place. Ralph's parents were in agreement that the best place for Charlie to heal was out west but they had not accounted for the hard labor which went into building and maintaining a ranch. Nevertheless, his father throws his heart into the land and his family and does see improvement in his health situation. In the meantime, Ralph thrives on the land. He discovers he has a passion for horses and has great skill when it comes to riding and training the wild ones. When the story opens, Ralph is a mere six years old but he learns quickly how to play the man in helping his father with life on the ranch and with the family farming efforts. When the book closes, Ralph is 11 and has learned quite a few solid life lessons, to be sure. My favorite character in this book is Ralph's father, Charlie. That is exactly what Ralph, the author, intended. It is clear that he both loved and respected his father a great deal. I love how old-fashioned this book is in that it has parents speaking honest and forthright to their kids about what it means to be a good man or woman. Charlie doesn't mince words with his son as he disciplines him, corrects him and guides him into manhood. I marked some of my favorite passages. Ralph had taken a fairly untrained and wild horse off to do a job without his father's permission. Ralph had taken an unnecessary risk and ended up placing himself in quite a bit of danger. "Son, there is no question that the thing you have done today deserves severe punishment. You might have killed yourself or the horse, but much worse than that, you have injured your own character. A man's character is like his house. If he tears boards off his house and burns them to keep himself warm and comfortable, his house soon becomes a ruin. If he tells lies to be able to do the things he shouldn't do but wants to, his character is a sham on the face of the earth." Now, that's tellin' it like it is! Gotta wonder if kids these days would spend more time focused on improving and keeping their character if adults were able to tell them plainly what is right and what is wrong. Charlie clearly believed that truth existed and that it was his duty to teach truth to his son. I like the man! Charlie's solid advice and speeches which he gave to his son were not always delivered when Ralph was doing wrong. Charlie watched his son and grew to know his heart. He found teachable moments to instruct Ralph in times when the truth would have the greatest impact on his heart and mind. He was a man who won the heart of his son and loved him deeply, by all accounts of this story. For example, it was against the law to kill a pheasant (it was never explained why) but Ralph had accidentally caught one in a steel trap. Charlie sent his young son into town with the dead bird to confess to the Sheriff and find out if there was anything that needed to be paid or taken care of in light of the bird's death. "That night when were milking, he told me it had been a day I should remember. He said it would be good for me, as I grew older, to know that a man always made his troubles less by going to meet them instead of waiting for them to catch up with him, or trying to run away from them." At another point, Ralph has a conversation with a girl who tells Ralph that people who have to work hard for their living are somewhat stupid. She boasted that her father claimed that the world owed him a living and that Ralph's dad was a fool for working so hard. Ralph told his dad about this conversation. "Any man who says the world owes him a living is dishonest. The same God that made you and me made this earth. And He planned it so that it would yield every single thing that people on it need. But He was careful to plan it so that it would only yield up its wealth in exchange for the labor of man. Any man who tries to share in that wealth without contributing the work of his brain or his hands is dishonest." "You know, Son, sometimes a fellow has to take a licking for doing the right thing. A licking only lasts a short while, even if it's a hard one, but failing to do the right thing will often make a mark on a man that will last forever." In other words, Charlie acknowledged to Ralph that he had been wronged. At the same time though he assures him that by doing the right thing even when he is unfairly treated is the most admirable thing and will make a man worth knowing out of him. Now, Little Britches isn't the Book of Proverbs or anything, but it is chalk full of lessons about what it means to be honest, to put in a good day of work, to earn an honest living, to be trustworthy, and to care for one's family and neighbors. Yes, there is some crude language scattered about. I'll be blunt and tell you what it is so that you know: there is an overuse of the word "damn" and plenty of instances of taking God's name in vain. Ralph points out multiple times that his father was not a swearing man and that he didn't want his children to use swear words. Yet Ralph includes it in the story as used by cowboys and neighbors. If you opt to read this book aloud, it would be remarkably easy to skip over these words or change them for your reading audience. If you are reading it to yourself, then you can consider the language. As my regulars know, I really do not have a high tolerance for foul language and regret when I find it in a book. I regret that I find it in this book. However, I was fairly warned and as my friend LT says, this is still a book worth reading. I agree with her whole heartily. If you can find a copy of this book, I highly recommend it to you. Also of note is the fact that this is the first book in a series by Moody about his growing up years. I honestly don't know if I'd want to read the others because of the way that this particular book ends. However, I do love the first title and am super glad for the gift of it! Book two is a cliffhanger ending, but book three feels a bit more resolved. My girls LOVE these books (sanitized of profanity via my reading aloud). They're ones I missed growing up but have so enjoyed discovering with my children. Oh, the sequels are definitely worth the read. I had never heard of the book or author, but the book sounds interesting. This series is a favorite in our house! I highly recommend continuing the series. I was introduced to this series earlier this year, and I'm looking forward to reading them to my kids soon, too. I enjoyed your review and reading some of my favorite passages again, too! Huh! Never heard of it! It's interesting to hear how so many sanitize it as a read aloud. My oldest reads over my shoulder (and corrects me!) as I read aloud! I'm not sure I could do it, but if I find a copy, I may try! I've heard such good reviews about thee Ralph Moody series. I don't have any of them yet, but I definitely want to get them for my daughter to enjoy one day. You should give the other books in the series a try. They are all really good. My kids have all loved them! Sounds like it would be up my alley. Thanks for the recommendation. I'll see if I can't find a copy somewhere. Have a nice weekend!